In my recent models serving book I introduced treating models as data and showed how this approach can significantly simplify model serving, including real-time model updates. The main limitation of the solution presented in the book is a single model per data type, which is rarely the case in the real life deployments. As described in detail by Ted Dunning, in his Machine Learning Logistics book, in real life deployments, there is typically an ensemble of models scoring the same data item in parallel and then a decision block decides which result to use. In this blog post, I describe how to extend the solution described in the models serving book to support speculative model serving and I provide an implementation based on Akka Streams. The complete code of the implementation described in this post is available from GitHub. an optimization technique where a computer system performs some task that may not be needed. Work is done before it is known whether it is actually needed, so as to prevent a delay that would have to be incurred by doing the work after it is known that it is needed. If it turns out the work was not needed after all, most changes made by the work are reverted and the results are ignored. The objective is to provide more concurrency if extra resources are available. This approach is employed in a variety of areas, including branch prediction in pipelined processors, value prediction for exploiting value locality, prefetching memory and files etc. In the case of Model Serving, speculative execution means scoring data in parallel leveraging a set of models, then selecting the best score based on some metric. The use case where this becomes important is where there are several models that differ in performance or result quality from one case to another. Consensus based model serving. Assuming that we have several models, we can implement model serving where prediction is the one returned by the majority of the models. Quality based model serving. Assuming that we have an metric allowing us to evaluate the quality of model serving results, this approach allows us to pick the result with the best quality. It is, of course, possible to combine multiple feature, for example, consensus based model serving with the guaranteed execution time, where the consensus result is used when it completes within a given time interval. Here, incoming data is feed into both the Model Serving Controller and the Model Learning (training) component. 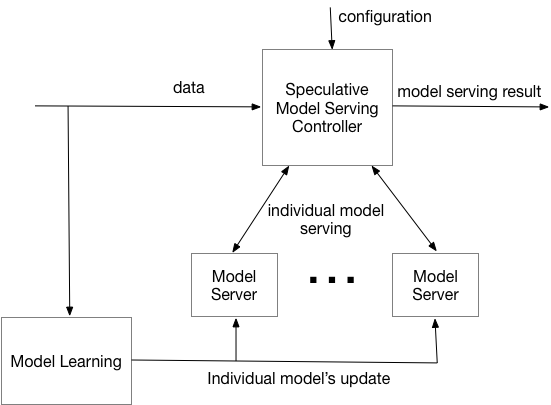 The Model Learning component is used for periodic recalculation of models, after which updates are pushed into Kafka for ingestion by the Model Servers. In the heart of our implementation is the Model Serving Controller responsible for orchestration of execution of individual Model Servers and deciding on the final model serving result. Once replies from all of the individual Model Servers are received or the wait time expires, the Model Serving Controller chooses the reply, based on some defined criteria. The reply is propagated downstream. Individual Model Servers process the input data based on their current model and return results back to the Model Serving Controller. Additionally, the Model Servers are listening to the Kafka topics with model updates. The model serving result can be accompanied by a confidence level. This information is optional and, if present, can be used by the Model Serving Controller to evaluate the result. Additional optional fields can be added to the Model Server replies for use when evaluating the results. 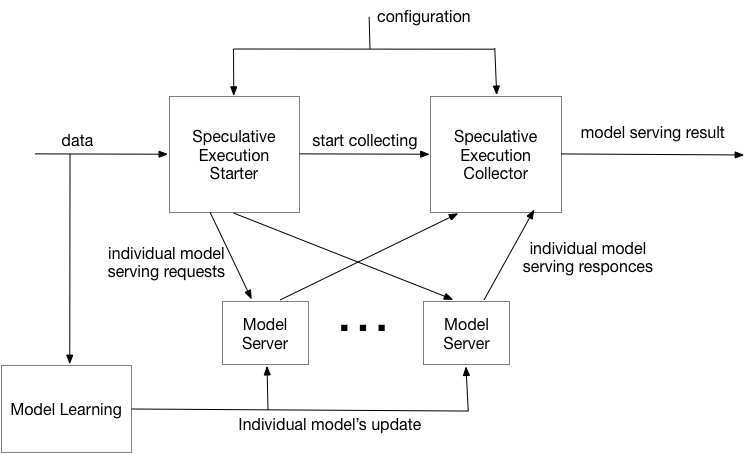 An additional aspect in the overall system is configuration of speculative server. Using another Kafka topic allows change models ensemble for a given data type and some of decision making configurations. So that the Model Serving Controller knows when a reply has been received for a particular datum, a “handshake” in our implementation is provided by a unique id (GUID), which is passed to the Model Servers and is returned back to the controller along with the serving result. // Description of the model serving request. // Description of the model serving response. // Description of the model serving qualifier. Although there are many different options for implementing this architecture, we will show how to implement it leveraging Akka Streams integrated with Actors. We will implement individual model servers and model service controller as Actors and use Akka Streams for overall orchestration of execution and Akka HTTP for providing HTTP access to our implementation. The actors in this hierarchy are described below. // Redirect to model update. Data manager is also a singleton, responsible for management of all speculative model serving controllers including their creation, configuration and routing model serving data requests to them. This implementation relies on REST Server implementing queryable state similar to the implementation described in models serving book. Here we introduced 2 additional actors - starter/collector pair. Execution of the individual actors is orchestrated by Akka stream implementation similar to the one presented above. In this post I have described how to extend a model serving approach based on representation of model as data described in models serving book by incorporating speculative model serving as defined in Machine Learning Logistics book. I have defined the advantages of speculative model serving and presented an Akka-based implementation for it. Boris Lublinsky is a Principal Architect at Lightbend. Boris has over 25 years experience in enterprise, technical architecture, and software engineering. He is an active member of OASIS SOA RM committee, co-author of Applied SOA: Service-Oriented Architecture and Design Strategies (Wiley), Professional Hadoop Solutions (Wiley), and Serving Machine Learning Models (O’Reilly).